2. Rub meat with sea salt and pepper; set aside. 3. In medium bowl, whisk together barbecue sauce, Root Beer, & seasoned salt, until smooth, then add onion. 4. Place meat into gallon-size Ziploc bags. 5. Pour sauce over meat; freeze until needed. 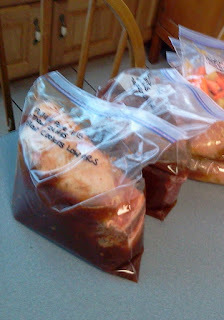 1 Thaw in refrigerator; pour contents into slow cooker and cook on LOW heat for 8 hours. 3 Serve on rolls or hamburger buns.